Rice is a multifaceted grain and can be used to prepare an array of dishes. It can be transformed into sweet, savory, spicy or bland delicacies. It is one of the major source of carbohydrates. Carbohydrates are majorly classified into simple or complex and is the major source of energy out of all food groups. In India, 70-80% of the diet comprises of carbohydrates present in cereals, millets and pulses. Glycemic index of a food item equally plays an important role. It account for the ability of the carbohydrate in the food to increase the blood glucose levels depending on what type of carbohydrate it is. The Glycemic index for rice is 73, which falls under high GI category. As the glycemic index of rice is very high, it is usually not recommended to consume rice in a huge amount for people striving to lose weight or with any other lifestyle disease. Rice has simple starch which will increase the blood sugar levels instantly and hence not very healthy. It is advisable to incorporate good amount of vegetables in a small serving of rice to increase the fiber content which will make it a wholesome nutritious recipe. You can also combine your rice with a handful of pulses (dals) making it a complete protein and guilt free recipe to have. Glycemic load is defined as the amount of carbohydrate present in the food and how the blood glucose levels rises with each gram of carbohydrate in the food. 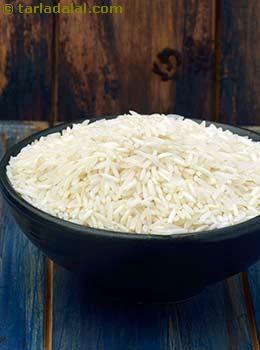 The Glycemic load for rice is calculated as follows: - glycemic index* amount of carbohydrate in a serving/100 .i.e. 73* 23/100 = 16.7. Is Rice Safe for Diabetics? Since the glycemic index of rice is high as well as the glycemic load of rice falls under medium category it is not recommended to have rice in large quantity at a time because it will spike your blood glucose levels instantly. There are few ways through which rice can be inculcated in the diet. Have a bowl of rice along with lots and lots of vegetables in the form of vegetable rice, vegetable biryani, vegetable fried rice, mixed vegetable khichdi etc. so that the balance is maintained. Rice can be cooked in the morning, cooled down for 7 to 8 hours in a refrigerator and then can be eaten with bowl of hot dal. The reason behind this is when the rice is cooled down for 7 to 8 hours, the simple starch in it gets converted into resistant starch which makes it healthier to consume. Resistant starch is a starch that reaches the bowel undigested, thus beneficial for diabetes. It also uplift the growth of healthy bacteria in the bowel, keeping it fit always. It is certain that rice is not good for weight loss as its got a high glycemic Index. As soon as you eat rice, your blood sugar levels will go up and shut down your fat burning process. If you must, then eat a small amount of rice with lots of dals and vegetables whicb will add protein and fiber to the meal making it healthier.